If you were to sum up business technology's 2012 in one word, it would be 'mobile'. As mobile devices such as smartphones and tablets became more powerful, affordable and useful, they became many people's primary gateways to consumer and business data. That trend had several effects. It made online businesses rush to make their sites mobile-friendly and responsive so they would work properly across myriad devices with differing screen sizes and specifications. It made mobile apps particularly important for B2C businesses, and user reviews increasingly important for app publishers. It also enabled many businesses to equip their employees with smartphones and tablets instead of desktops or laptops, or for employees to use their own mobile kit via under bring your own device (BYOD) policies. BYOD wasn't entirely positive. According to a survey by risk services firm Coalfire, while 84% of respondents used smartphones for work and personal business, 47% did not password protect them, and those who did tended to reuse the same password across devices and apps. 51% said their employers could not remotely erase the data on their phones, and 49% said IT departments had never spoken to them about mobile security. Other BYOD concerns included increased costs (because businesses could not benefit from bulk buying), potential one-upmanship between gadget-crazed employees, and software licensing hassles. The rise of mobile also shook up the smartphone market, with RIM's BlackBerry falling out of favour and Microsoft's Windows Phone struggling to get a foothold in a market dominated by Apple and Android. As tablets began to cannibalise PC sales, Microsoft fired its big guns: Windows 8, Windows RT and even a Microsoft-made tablet, the Surface. Now businesses could have their cake and eat it: their employees could strut around with tablets and touch-friendly apps, but to the IT department those devices were still PCs. Reviews of the new Windows products have been mixed, and occasionally hostile. While Windows 8 offers many improvements, including significantly increased performance, many people are perfectly happy with Windows' existing interface and don't see why Microsoft had to stick something touch-focused on top of it, especially when they have to keep exiting that interface to use legacy applications. It has not attracted the same derision as the launch of Windows Vista, but neither is it a compelling upgrade for businesses already running Windows 7. Neither is Windows RT, whose consumer focus means that the included Microsoft Office is not licensed for business use. However, even consumers seem wary: the Windows RT Surface has sold in modest numbers, and both Google and Facebook have yet to write apps for the platform. For its part, Microsoft says that Windows 8 sales have been faster than Windows 7's, but it doesn't say how many of those sales were to actual consumer and business users, and how many sales were to original equipment manufacturers. While Microsoft had its struggles, Apple soared - although some creative pros were not too happy with 2012's very minor Mac Pro refresh. 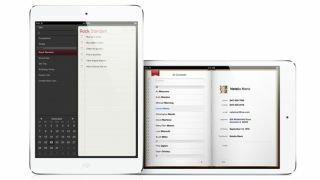 The iPad got a minor update to keep it fresh, but the big news was a little tablet, the iPad mini, which had significant SME appeal due to full iPad features at a significantly lower price. It didn't get near field communication (NFC) though, and neither did the iPhone 5. 2012 ended with NFC in much the same place as it was when the year began, with many retailers unwilling to invest in equipment enabled with the technology. While devices got smaller, data got bigger. You couldn't move in 2012 for talk of big data, the science of finding important needles in enormous haystacks of information. The problem for medium businesses is that the hardware, software and services required to mine such data tended to be expensive and therefore limited to the largest enterprises. But in 2012 big data began to become more affordable and available, with firms plugging into social networking insights and analytics and firms such as SAP bringing relevant products, in this case its HANA database system, into their SME-oriented packages. The other big development in 2012 was 3D printing. It has been around for several years now, but prices have plummeted, technology has been improved and 2012 even delivered a trade show, London's 3D Print Show. If the technology has an Apple it's probably MakerBot, whose £1,400 Replicator 2 is reminiscent of the early days of laser printers: a bit pricey and clunky for the mainstream, but getting there fast. For now 3D is best suited to one-offs and prototyping, but the potential for both small scale production and large scale piracy is enormous.